Free Starbucks Latte (at select stores) from 4-6pm Today! 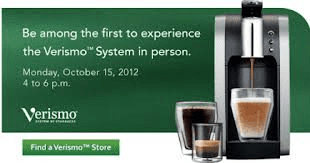 Starbucks is promoting their new Verismo machine today, Monday, October 15, 2012 from 4-6pm at select stores and giving FREE LATTES! To find a store with a Verismo, please click here. You may want to call before you stop by just in case. I called the Boston Common location and they are participating! Woohoo!